Note: This section is available only in versions earlier than Guardian 7.17. After setting up a trader, an administrator can assign a direct and/or proxy (TTORD) user ID to the trader's login. If you have already opened X_TRADER® and have successfully logged into at least one exchange, the Trader Login option allows you to log in to additional exchanges without closing X_TRADER. Warning: For a different trader to log in, you must close and then re-open X_TRADER. If you attempt a login via the Guardian Trader Login option, without closing X_TRADER, the login will appear to be successful. The Status column in the Guardian window will change to reflect the "new" trader ID. However, all trades will be attributed to the original trader’s account. For example, all Audit Trail messages will point to the original trader. On the File menu, click Trader Login. 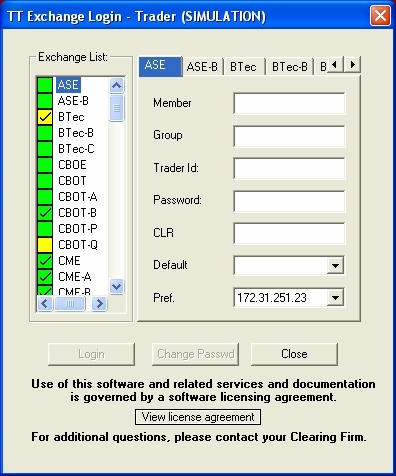 The Exchange Login dialog box displays. Select the appropriate exchange tab, and type your login data. After a successful login, a check mark appears in the exchange’s status box. Repeat the above steps for any additional exchanges. Click Close to exit from the dialog box.